This savory kugel of sweet potato and parsnip is the perfect vegetable casserole side dish. Simple and easy to make using a spiralizer, this recipe brings big, bold flavor which can be enjoyed hot or cold. Per Serving: 205 calories; 15g fat; 15.0g carbohydrates; 5g protein; 93mg cholesterol; 453mg sodium. 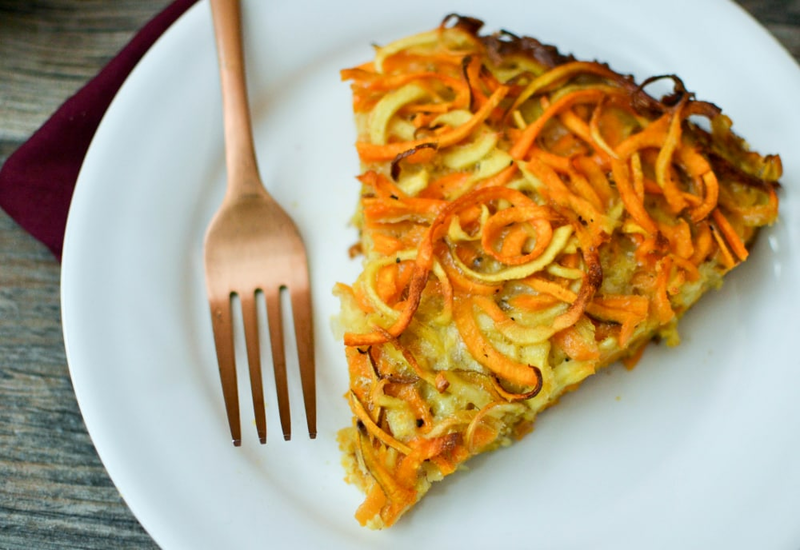 The sweet potato flavor of the kugel was definitely the bright spot in this recipe. Never realized how easy it was to make a kugel casserole! The crunchy texture on the outside was perfect. Very good kugel recipe. I've tried so many different variations, and this one is one of my favorites. I like the use of spiralized sweet potatoes and parsnip, as opposed to the traditional noodle or grated potato. No amount of sweet potatoes listed, going to try 2 to 3 cut the same as the parsnips.